Ferrari has been working for almost a decade on the lightweight 4wd system that debuts on the FF. BRUNICO, Italy – Ferrari S.p.A. said the first year of production of its new FF is sold out and customers who order the model now will receive their cars in the second half of 2012. Ferrari will limit production of the FF, the luxury sports car maker's first four-wheel-drive model, to 800 units a year. The FF sells for 260,000 euros in Italy, where it goes on sale in May. Production is currently ramping up and is expected to reach its full speed of 70 units a month by June. Ferrari says it has already 800 orders of the FF after the company began private previews with potential customers in mid-January. The FF, which stands for Ferrari Four, replaces the company's 612 Scaglietti flagship.The FF is marginally bigger and roomier than the Scaglietti but weighs the same at 1790kg despite adding fwd. 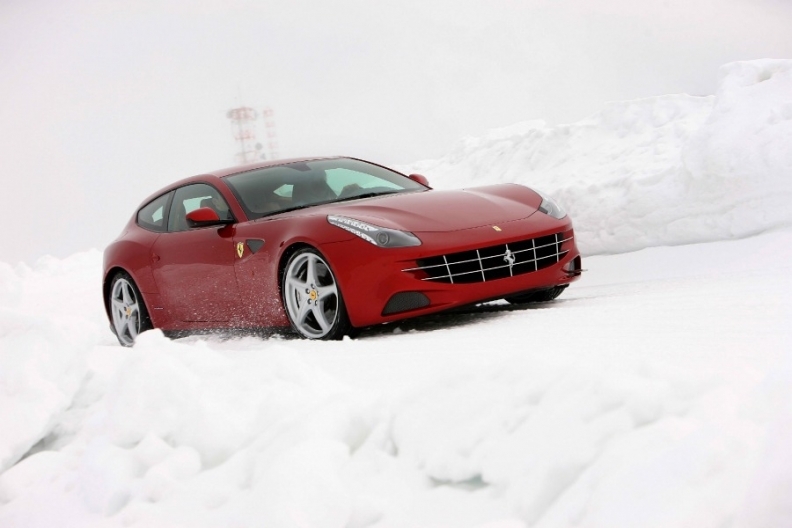 Ferrari has been working for almost a decade on the innovative, lightweight 4wd system that debuts on the FF. "Our 4wd system weighs about 45kgs, half of traditional 4wd systems which, to transfer torque to the front wheels in 4wd mode, need a central and a front differential," said Andrea Binotti, chief engineer for the FF, at the car's press launch here. Ferrari's system, called 4RM, adds a second, smaller, two-gear gearbox in front of the engine to transfer torque to the front wheels. The main gearbox, a seven-speed dual-clutch unit, is mounted in a transaxle design in the rear to power the rear wheels. The 4RM keeps an almost perfect weigh balance in the car, with 47 percent of weight on the front axle and 53 percent on the rear axle. In gears from first to fourth, when needed, the FF electronically transfers up to 47 percent of the 683Nm massive torque to the front wheels. In higher gears or on high grip surfaces, all the torque goes to the rear wheels. The FF is powered by a new 660-hp, 6.3-liter V-12 direct-injection engine that takes the car to a 335kph top speed and to just 3.7 seconds to accelerate from 0 to 100kph. Despite having more horsepower than the 540-hp 5.75-liter Scaglietti, the FF is more fuel efficient with CO2 emissions of 360 grams per kilometer, compared with the Scaglietti's CO2 emissions of 470g/km. Ferrari product marketing director Marco Valentini said the FF, the world's fastest four-seat model, "creates a segment of its own because no other competitors match the model for roominess and all-round versatility." Italdesign-Giugiaro S.p.A. penned the FF interior and also performed some body engineering for the FF project.